Our newest client discusses what led him to contact Istueta Roofing. 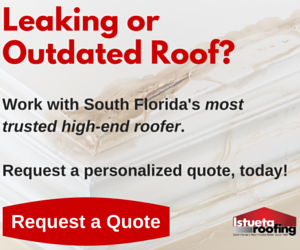 He mentions how he believes Istueta Roofing is the most respectful and respected roofing contractor in Miami, FL and he describes the great projects Istueta Roofing has done in his neighborhood. Our client really appreciated the friendly and honest customer service he received and the efficiency & cleanliness during the installment of his new roof. Thank you for giving us the opportunity to serve you!